Mobile VoIP (a.k.a. mVoIP) is a network and protocol extension of a Voice over IP (VoIP) network application protocol. Its main functional objective is to allow for a use of mobile phones to initiate and receive VoIP calls. The key part of mVoIP supporting terminal mobility (which itself is an application-level protocol) is VoIP as an underlying realtime application. Session Initiation Protocol (SIP) by the Internet Engineering Task Force (IETF). Differences between both protocol stacks are in philosophy, flexibility, specific formats, scalability and other aspects, including architectural differences. In this note we cover H.323 protocol stack selected functional items. 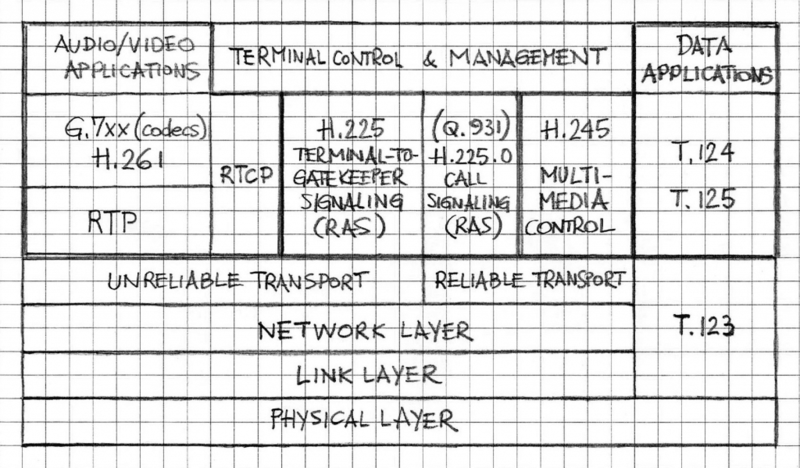 Components of an H.323 system include Terminals, Gateways, Gatekeepers, Multipoint Controllers, Multipoint Processors and Multipoint Control Units. In this note we limit our consideration to Voice Terminals, and, in this specific case, mobile phones. Most mobile phones sold today are sophisticated enough to use mVoIP. Furthermore, the availability of high-speed networks (WiFi, LTE, 3G, EDGE, WiMAX) means that there are now advantages in using mVoIP such as opening up new business opportunities (cf. Ref. ). 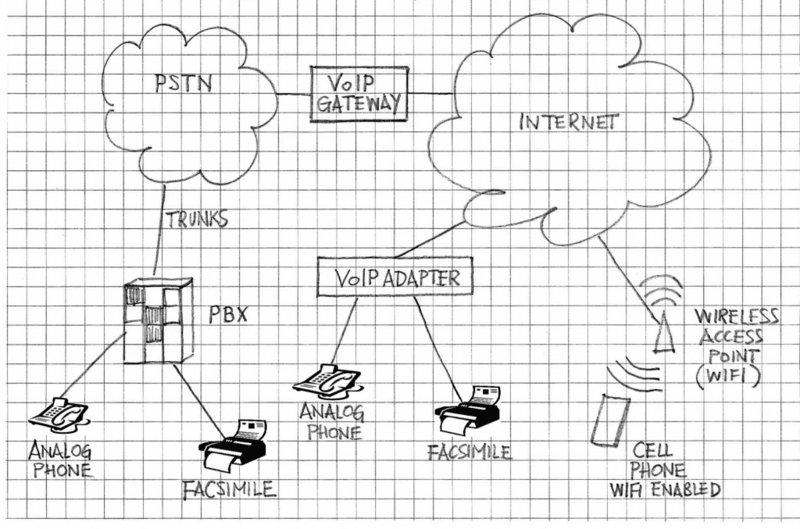 Figure 1: An example of a Voice-over-IP network with various end points, including mobile VoIP terminals. Typically mobile VoIP works with a cell phone’s 3G, 4G, GSM, or other Internet service to send/receive voice calls as digital signals over the Internet using voice over IP technology. Mobile VoIP phones can also take advantage of WiFi hotspots to eliminate the calling costs of a cellular voice or data plans. Cell phone users can use mobile VoIP service on their phone by adding mobile VoIP application software. There is a variety of software solutions/applications that can “convert” a cell phone into a mobile VoIP phone. An example of a hybrid network depicting different ways of accessing an IP network for the purpose of using voice service is shown in Figure 1. The network protocol perspective to mobile VoIP is presented in several application research papers. One of them, Ref. , approaches the subject by pointing to one of the current implementations of mVoIP based on the ITU-T H.323 Multimedia standard. For illustration purposes the H.323 protocol stack is shown in Figure 2. Message flow in a H.323 call starts with an exchange of call-establishment messages (as per Q.931) . Subsequently, message exchange and call capabilities negotiation is performed according to the communications control protocol (H.245) . Then, channels for the exchange of realtime data (such as voice packets) are established and open. To complete the call opening for realtime data exchange (including time-critical voice and video streams), the Real Time Protocol (RTP) and Real Time Control Protocol (RTCP) are used. An H.323 endpoint can be on a wireless network such an IEEE 802.11 wireless LAN or on other typical wireless networks. (Note IEEE 802.11 standard and amendments provide the basis for wireless network products using the WiFi brand, cf. Figure 1). Macro-mobility: support when the host moves into a new subnet; implies that this change has to be detected and a valid IP address for the new subnet to be acquired; the change of the IP address cannot cause the termination of ongoing VoIP. Micro-mobility, as described above, is handled at the link layer by the 802.11 implementation. The macro-mobility scenario defines the problem as the one to be solved by mVoIP. Handling this problem at the application level enables the application to respond in the most suitable way to the change in network address. In realtime applications, such as voice and video, that are sensitive to data transmission latency, a suitable response is to resume ongoing calls as quickly as possible. Other aspects of mVoIP include its use in conjunction with a directory service (for address resolution), call handoff, mobility alert and IP update messaging, calling into mobile hosts (using in conjunction with dynamic directory infrastructure) and security and encryption support. VOCAL’s mVoIP solutions provide a comprehensive mobile VoIP software library to develop custom mVoIP applications for cell phones, tablets and other mobile devices. Selected details are included in Ref.) . Contact us to discuss your mobile VoIP application with our engineering staff.